June was a busy month, both in and out of the kitchen. I was able to play around with my orders a little more this month and things got cute! I love being able to try new things and I enjoy seeing my customer’s reactions when they see their orders. Since May was a slow month, I’ve lumped those orders into this post as well. Keep on reading to see what I created in May and June. You. Guys. These are my new favorite cake pops to make. I made these for a little girl’s birthday party and I couldn’t stop squealing. These were a hit both at with the customer and on social media. I have a few more orders in for these because people loved them as much as I do. I think these will be a regular on these monthly order posts. One of my friends recently graduated from the University of Dayton and ordered 2 batches of cake balls with UD colors. She got strawberry and chocolate cake balls to celebrate her graduation with. This color scheme was also a hit last weekend with the 4th of July! This batch went out for Mother’s Day and was decked out in the mom’s favorite colors. The chocolate and strawberry cake balls are dipped in white almond bark and have purple drizzle. These purplish-pink cake balls were another Mother’s Day order for a coworker of mine. I tried my hand at making a different color for these and failed a little bit. Luckily my coworker was fine with the color and they were a hit at their get together that weekend. These cake pops were for a baby shower, which makes me so happy. I love making cake balls or cake pops for gender reveals and baby showers because they turn out so cute! These were chocolate cake pops dipped in white with pink drizzle and heart sprinkles. When I was asked to do these, I was a little nervous. I’m not a very “artsy” person and I can only draw stick figures, so anything more than sprinkles or drizzle intimidate me. After doing a test run of these, I agreed to make the order. I was surprised at how well these turned out! These are chocolate cake pops with a red and white dip and a candy pearl. In June, I discovered cake dust and I’m obsessed.I had an order for strawberry cake balls dipped in navy blue with gold dust on top. Although the dusting looks silver in the photo, it was gold in person. I want to spread this dust on everything! Atelier Adorn USA in Hyde Park had a semi-annual sale and ordered some sparkly cake balls to give to their customers. 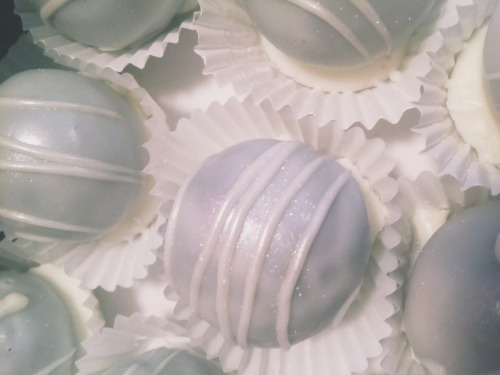 These were chocolate cake balls dipped in white with white drizzle and silver dust as well as vanilla cake balls dipped in cream with cream drizzle and gold dust. I got a great review from the ladies at Atelier a few days later! I hope you guys enjoyed reading about these orders as much as I enjoyed making them! I’ve expanded our selection a little more, so be sure to check out the “Prices” page to see what’s available! If you’re in the Cincinnati or Dayton area, you can place an order on the “Order” page.